HomeHow To Write SEO Friendly ArticleHow To Write SEO Friendly Article? 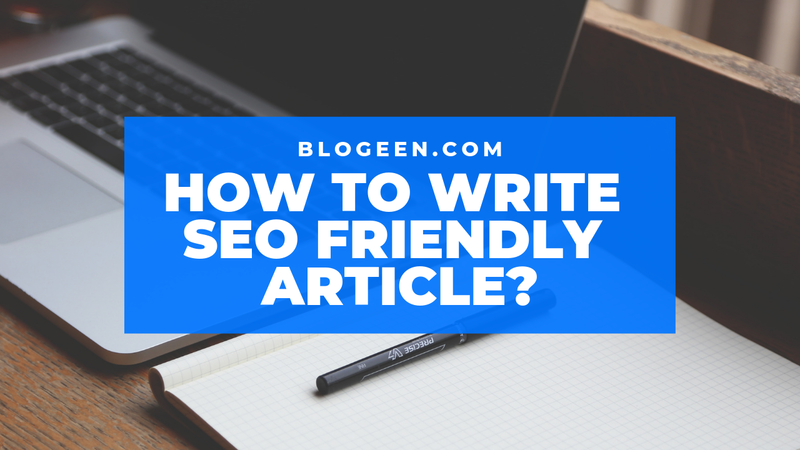 Today almost every new blogger is facing a problem for Writing SEO Friendly Articles most of the new bloggers don't know How To Write SEO Friendly Article. Then hello everyone my name is Varun Sharma and today I am going to tell you How To Write SEO Friendly Article. Friends writing a SEO Friendly Article is a very important task. If you want to rank your post then you have to write SEO Friendly Article. We continuously Publish posts but, on Post Search, there is no Show on First Page. For this I am going to tell you some ways that will follow the best SEO Friendly article which will definitely show up on the first page in the search engine. Many of the posts related to SEO (Search Engine Optimization) have been postmarked in many past posts. Today SEO has become a very big part. Ranking a site without SEO is not possible. Whatever you write on your blog, it is already written on some other blogs. In this case, only one way is to get good SEO strategies to rank the site in Google Search Engine. Apart from SEO, there is also a way that post can be ranked. High Quality Content When it comes to quality content, there are many points in it. 1. It means content should be informative, which can benefit readers. 3. Must have accurate information. 4. Do not write anything so that bad impressions are formed. 6. Use in Media related to Post (Image & Video). 1.The language of Blog is anything but always use Simple Word. 2. Readers come to read the information given by you, do not come to check your Writing Level. 3. The more you write simple words, the more you will be benefited. 4. Follow KISS Rule: Keep it Short and Simple. 1. Before you write on any topic, check how much it is done in search of it. 2. If the search is low, even if your website Rank 1 is coming but it will not be of any use. 3.Use Google Adwords to find number of searches. 4.Besides Google Adwords, you can also use Google Webmaster. 1. If you are a Blogger or Site Owner whose Adsense is the only income source, then you should check the Bid Rate and write an article. 2.Bid Rate is not good, income is low. 3.The Hindi language website's income is always less than the English Language website. If there is a blog in Hindi language then hard work will be done more. Keyword Density: Whenever a blogger writes Blog Post, he does mention about that word several times, so that the relevant post writes. The related word is keyword and its usage is how many times it has been used, which is called Keyword Density. It has great importance in SEO. As an example, in an article there are 2000 words in which the keyword is written 50 times, its density will be 2.5%. Keeping SEO in mind the keyword density maximum should be 4%. Keyword Proximity: The distance between 2 keywords in Blog Post is called keyword proximity. You can put keywords in many places in the post, it also crawls the search engine. Example. If someone searches in a Search Engine "How to create a free Blog" then Google shows Result of "How To & Free Blog". In all these, Exact keyword is "Create Free Blog", which is the distance between Free Blog and create, the same keyword will be called proximity. Keyword Prominence: The placement of keywords in the article is called keyword prominence. While writing a post, keep this in mind as to where Keyword should be written. Writing in the wrong place should not be reduced to Traffic Increase. Before writing articles for this you have to do some work to think about what to write and how to start from where. The first step for this is to create a blue print. Perhaps you might be wondering what this Blue Print is. Blue Print Make Structure Of The Mean Post There are many parts in any post. Description: Description only shows in SERP. Search engine reads only the description. The description inside the red box is shown. Keyword: Many articles related to Keyword were published which are followed. Introduction: The first paragraph of post is introduction part. Write introduction very clear. Main Body: Content is written in it. Conclusion: At the end of the post, the conclusion should mean summary. Internal Linking: Links that link to one page of the same website to another page and this process is called internal linking. Bounce Rate decreases with interlinking. User engagement increases. In many paragraph posts should reduce the writing. As mentioned above, Introduction, Main Body and Conclusion Explain what is written in the Blog Post Title in Short. The way of getting started is something that reads the user's interest. By doing so, the bounce rate gets reduced, which has a good effect on SEO. One or two Longtail keywords must definitely focus on any content. Do not target many Keyword at all in one post. Doing so will not get a rank on any keyword. User mostly do long tail keyword search. Result will be very good if you type target by posting keyword. In all posts, post maximum to Target only 2 Keyword. Those users who come to your website by searching long tail keywords, give time on site. Which means the site's Avg Time Increase. Keyword should be used in a genuine way. The user or search engine should not think that by force is done. Must add the Main Keyword to the specific part of the post. Adding to Main Part Crawl Search Engine quickly. Which makes rank easy to rank. Use the main keyword at all these places. See example below in Screen Short. Blog should be responsive. Today, most users are mobile users. The blog's design is not visible in Mobile. That's why more attention than design is needed to focus more on content and Page Speed. Almost all the themes of Wordpress are responsive; Some have to enable this feature. 1. New Blogger or Website Owner whenever they write articles on a topic, they do not do keyword research. Let's write a post on any keyword with your mind. 2. They do not have any meaning with the keyword's analysis. The keywords on which the post is written, does not mean anything about Traffic or Competition. 3.Whenever you start working on a keyword, first analyze that keyword well, how much traffic and competition is on keywords. 4.The lower the competition, the faster the site will come to the first page of the search engine. 5. As the competition is low, Searches must be accompanied. 6. There are several tools for keyword research, but the best and free tool is Google's keyword planner tool. 1.To write SEO Friendly Blog post, write a nice little Catchy Title. 2. Because the visitor first reads the title. 3.Try writing Catchy Tittle before writing the article. 4.Use main keyword in title. First Impression is Last Impression Remember it forever. Post URLs also help in improving the ranking of the article. To make SEO friendly blog url, follow some of Guruji's tips. It starts with the domain name itself. Register the short and easy to remember domain name for the site. Use the focus Keyword in the URL only once. The Target Keyword of this Post has yet to be known. You can tell it in the Comment Box. All in One SEO Plugin is installed on this site. The Title Tag appears only in the Search Engine. Typically bloggers end up typing Title tag and description. While we are first guided to write Title tag and Description. You can use only 60 characters in the title tag, more than that is not seen in the search result. You can only use up to 160 characters in the description. Add main keyword to title and description. Conclusion:- Hey friends hope you will like our post How To Write SEO Friendly Article. Friends by using our these steps you can easily write SEO Friendly Article And you can easily rank your website higher on the google, friends don't forgot to share your experience with us by commenting and if you have any type of question or problem you can comment us we will surely find your solution and reply you. Thanks a lot !